Messiah College’s Digital History class is currently finishing the digitization of the 1900 Census Records from the city of Harrisburg. I have digitized segments of Wards 3, 4, and 9. In looking at the map below, you can identify the wards by the large numbers throughout. While working on digitizing these wards, many interesting discoveries were made. 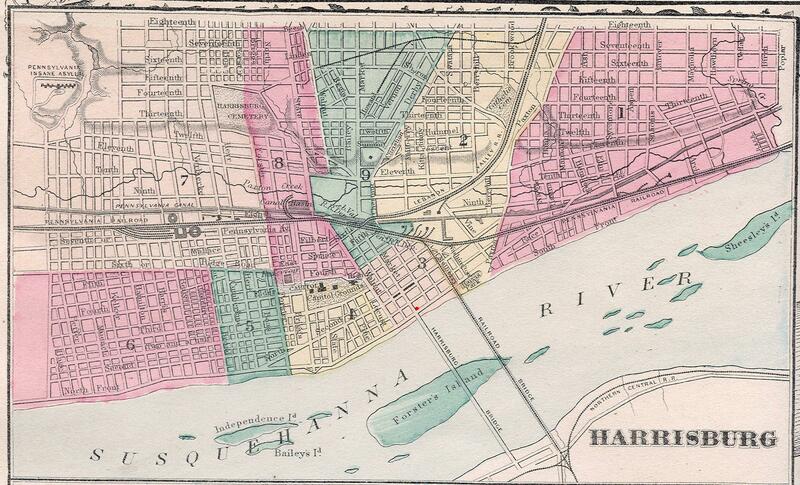 In these three wards, the majority of the citizens were white, employed, and educated. Additionally, those who were not educated were at school receiving their education. While many people in Wards 3, 4, and 9 were employed by the Pennsylvania Railroad, there were also citizens with jobs such as insurance agents, bakers, and musicians. Transcribing the jobs of the citizens proved to be a challenge, because some of the occupations no longer exist, or are not in such high demand any longer. For example, a citizen living in the 4th Ward held the position of “Folder” for a book binding company. Other jobs held during this time, such as “milliner” and “huckster,” are foreign to a student living the 21st century. Although at first it was confusing to try to decipher whether or not the writer of the Census Record was trying to write something else entirely, or if this was a job in the past, by the end, this process has taught a great deal about the period through looking at the average citizens. One particularly interesting discovery comes from Ward 4. The governor of Harrisburg at the time, William A. Stone, lived on Trout Street in Ward 4 of Harrisburg with his wife, four children, four servants, and housekeeper. The Stone family had six children, but only four of them were surviving by the 1900 Census. The Governor’s family came from Pennsylvania and Massachusetts, and every member of his family and household staff were educated and literate. Since this time, the residence of the governor has changed, and is currently located on Front Street in Harrisburg. ← So What Exactly are We Doing? Does anyone have an accurate data representation for the peak population of Harrisburg and it’s city boundary definition during that peak? This would be helpful to know when speaking during walking tours of the neighborhood. Rob, sorry, I missed replying to this one. I use the figures for 1930 in Beer’s City Contented, City Discontented, and Barton’s Illustrated History. When our project is finished, we should be able to provide some absolute checks on that. We’d like to take the census data through 1930.